When I first started writing these Monday Meditations I was surprised how the readings often seemed patched together. Now I’m surprised to find one that’s a coherent story — as is the case in the Gospel for the 28th Sunday in Ordinary Time. It is a nuanced conversation on the topic of wealth and discipleship. There are days and days of meditation in here (or weeks and weeks of sermons). 1. A rich man runs up to ask about eternal life, and eventually Jesus tells him to sell his possessions and give to the poor — which he won’t do. 2. Jesus chats with his friends about how hard it is for the rich to enter God’s kingdom — but it’s not impossible for God. 3. 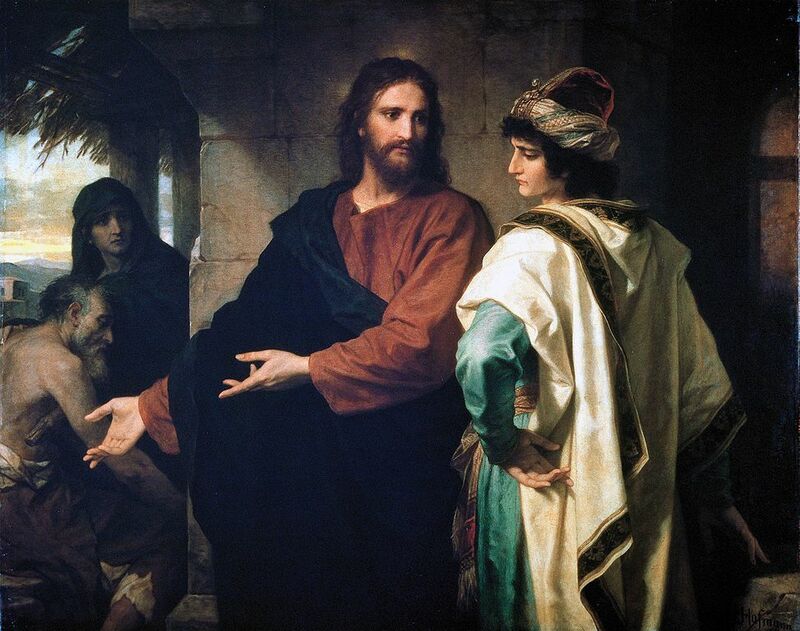 Peter points out how the disciples have already done what Jesus asked of the rich guy — and Jesus says doing so they’ve gained a hundred times more, both here and in the next world. I find I’m most captivated by the first of these conversations. It is peppered with unexpected bits. First, Jesus starts off by being a bit flippant. The man does not respond. Jesus doesn’t comment further. Mark, our narrator, whispers nothing from the wings. John’s Gospel makes that kind of point much more often and much more directly. Mark seems to want us to ponder it, to come to our own conclusions. Second, Jesus sneaks in a subtle bit of personal application. After Mark’s minimal description of the guy (he is a man, and he is rich) the conversation tells us that he is a faithful keeper of the commandments. That’s all we get — but it’s a serious mark of faithfulness. God gave the people of Israel the covenant, the Ten Commandments, as the shape of faithful life as the people of God. This guy does it. But when Jesus answered the man’s question about the way to eternal life, he cited fully half of the decalogue. There are a number of relevant commands in the Pentateuch. But it isn’t in the passages Jesus was paraphrasing. Maybe Jesus suspected that this fellow had some hidden issues living by God’s commandments. No outright stealing, sure, but maybe a bit of fraud here and there — some false measures, some cheating of his customers, some falsified reports filed with the government, whatever. Anyway, Jesus adds “do not defraud” to his summary of the commands. Jesus doesn’t accuse him. Jesus just sort of nudges him. Kind of like the Holy Spirit, right? Still, the man claims he’s fine. He’s kept all these from childhood. Cha ching! Does that mean he has eternal life? Third, Jesus doesn’t get judgy. I really like that. I mean, that just about melts me. Mark makes sure we see something quiet, something we might have missed even if we were standing right there at the time. Jesus looked straight at the man. But he didn’t look at him the way Christians often look — you know, like when we are trying to argue a non-Christian into converting, or trying to fix the politics of a misguided Christian on Facebook. Jesus looked at the man with eyes of love. Jesus saw the man as he was and he kept looking. Jesus had something more to say, but it wasn’t going to come as criticism. It was an invitation. Really. And what will be the consequence of accepting that invitation? Actually no. That’s just the second step in the journey. First step: basic obedience to God’s basic commands. Second step: detach from your stuff, you rich kid you. Detach from following your wallet around. Like give it away. Eternal life? It’s following Jesus. Do what you need to to be free enough to follow. Then be on the journey with the Good Teacher who really is God. That’s real life, now and in eternity.